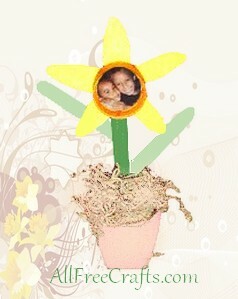 This potted daffodil picture is easy to make from popsicle sticks or craft sticks, a pop bottle cap, and a clay pot. The surprise is the photo in the middle of the daffodil – a nice gift for mom on Valentine’s Day or Mother’s Day. Printed pattern for the daffodil. Clean your soda bottle cap and let dry. Paint the bottle cap orange inside and out and let it dry. Print and cut out the daffodil pattern. Trace around the daffodil pattern on yellow fun foam and carefully cut out the flower. Trace the bottom of the soda bottle cap onto the small photo that you have chosen, then cut out on the inside of the trace line. You may need to go just a little smaller than this to get the picture to fit inside the cap – test it out and adjust as needed. Glue the photo to center of the soda bottle cap. With scissors, cut the two popsicle sticks on an angle to make leaves. You will need about a third of each stick – don’t use good scissors for cutting these! If you prefer, cut two leaf shapes from green fun foam. If desired, paint the clay pot in the color of your choice. Paint the popsicle stick leaves and stem in green paint and let dry. Glue the popsicle stick or fun foam leaves to the remaining popsicle stick. Glue the soda bottle top to the center of the foam daffodil. Glue the popsicle stick stem, with leaves already attached, to the back of the daffodil. Glue a small piece of floral foam into the pot then put on a little glue on the bottom of the popsicle stick flower stem and push it into the floral foam. Finish by gluing on a little Spanish moss or Easter grass. Enjoy !